All lanes of Interstate 5 in Tacoma were closed for several hours Tuesday morning after a semi jackknifed at Highway 16, according to the Washington State Patrol. The semi was heading south on I-5 when the driver lost control on the wet roadway, the State Patrol tweeted. No other vehicles were involved. 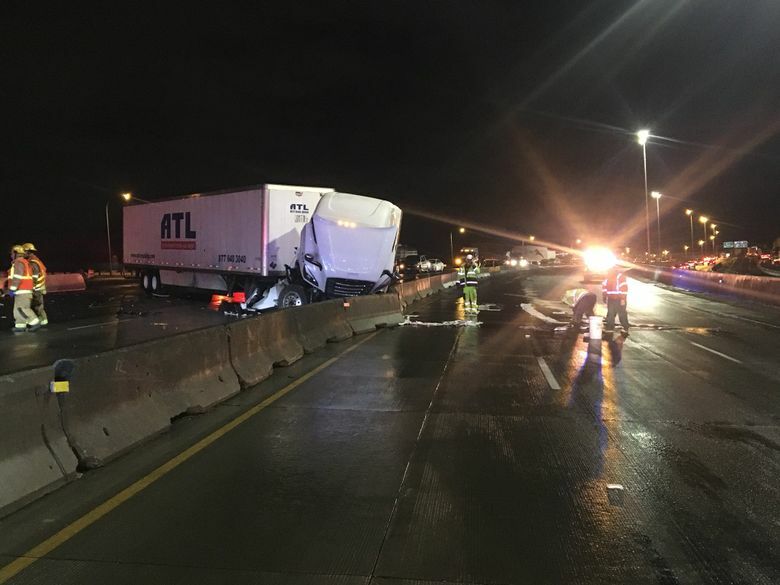 The truck and trailer blocked all southbound traffic until they could be pulled clear and the barrier could be put back into place; lanes reopened at about 8 a.m. Northbound lanes were closed until about 7:45 a.m. while crews cleaned up about 50 gallons of diesel fuel that spilled onto the highway. The truck’s driver has been cited for negligent driving in the second degree, Trooper Johnna Batiste, a state patrol spokesperson, said. The Tuesday morning crash occurred on a stretch of I-5 that has seen numerous crashes over the past several months. Batiste tweeted that by her count, eight crashes have occurred along that section of the freeway.